February 14th is right around the corner. Are you ready to feel the love without spending a bundle? Love is in the air with these Valentine’s Day crafts. Enjoy this special holiday with fun sewing projects you can make with or for your sweetie. Whether you want to make decorations like the Ruffle Heart Banner, a gift for your special someone like the Joyful Bear or just a simple game for the kids like the Felt Heart Memory Game, this collection has it all. Valentine’s Day Crafts are fun and easy to make. With any of these free sewing projects, you can make all your loved ones homemade gifts or decorate your home with tons of hearts for the love-ly day! This year, don’t forget about romantic Valentine’s Day crafts and Valentine’s Day crafts for kids. Valentines Mail Pouch Tutorial – For all the Valentines your child will receive, they’ll need a special place to store them. Create this holiday project that the kids will love. Let the Valentines Mail Pouch Tutorial teach you how. 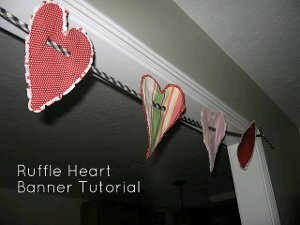 Ruffle Heart Banner – Decorate for your next Valentine’s Day party with this ruffle heart banner. Use our free beginner sewing projects to learn how to make a banner of hearts to hang on the wall to spice up any space. 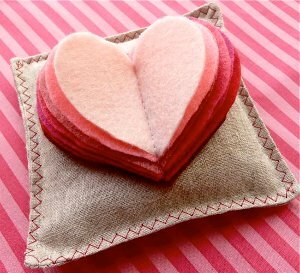 Heart Sachet – Sew up a quick and easy heart sachet to give to someone you love this Valentine’s Day. This free, easy holiday craft can be used to scent a room or filled with stuffing to make a tiny pillow. Charming Valentine Ornament – Make this cute sewn project in time to decorate a Valentine’s Day gift. Yes, it’s an ornament but it can also be used to make your Valentine’s gift extra special. Framed Ruffly Heart – Put your fabric on your walls this Valentine’s Day with this free, easy holiday craft. Make a framed ruffly heart to hang up and decorate your home for the holiday, or all year round. Romantic Ruffled Bracelet – Love is in the air and you’re feeling romantic. 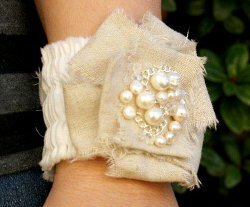 Make a pretty Romantic Ruffled Bracelet for an accessory to match the special holiday. 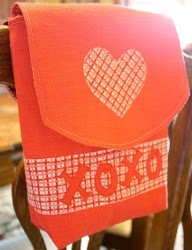 This easy sewing project is great for Valentine’s Day or any time of year. Simple V-Day Sachet – Make lots of simple V-Day sachets to give away on Valentine’s Day this year. This free, easy sewing pattern shows you how to make your own festive, fragrant sachets. Joyful Bear – Make this adorable and soft teddy bear for a special gift. They’ll love hugging their new friend and you’ll love that you made it yourself. The How Joyful Bear is sure to bring joy to a child’s life. Button Embellished Notebook Cover – Use this easy sewing project to make a button embellished notebook cover for your special Valentine. This project is great for Valentine’s Day or it can even be altered for a nice back-to-school gift for your child. Heart Shaped Zippered Pouches – Make these adorable heart shaped zippered pouches for Valentine’s Day. This simple holiday craft idea is great for storing Valentines and candy! Bonjour the Bear – Make this too-cute sewing pattern for the bear lover in your life. “Bonjour” the Bear is both easy and rewarding to put together. Plus, it’s really cute! Heart Shaped Pot Holders – Use this cute sewing project to make heart shaped pot holders, perfect for Valentine’s Day or for giving as a gift to the one you love. 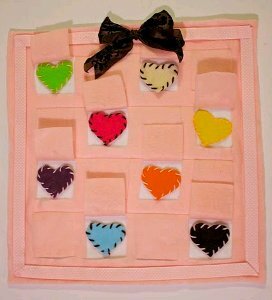 Felt Heart Memory Game – The felt heart memory game is a simple holiday craft idea to make for Valentine’s Day. Make this game for your kids to play with and sharpen their memories! 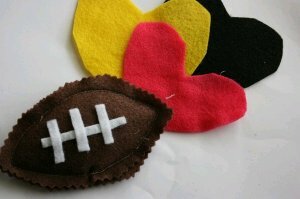 Valentines For Boys – Sew tiny football beanbags and attach to felt hearts for a very manly Valentine for your little boy to hand out at school. These Valentines for boys make a cute and very easy beginner sewing project. Tic-Tac-Toe Game – Did you know how easy it is to make a felt Tic-Tac-Toe Game? You can create this special game in time for Valentine’s Day. The kids will love playing with your sewn project. Valentine Countdown – Count down the days to Feb. 14th with this cute sewing project. The kids will love using the festive holiday calendar. Let the Valentine Countdown Project and Tutorial show you how to make this wonderful project. Valentine’s Day Appliqued Shirt – If you want to learn how to make your own clothes, start with embellishing what you’ve already got! Try this free, easy holiday craft to make a Valentine’s Day appliqued shirt. It’s festive and fun! Valentine’s Day Tutu Shirt – Your little girl will fall in love with this Valentine’s Day tutu shirt! Just make a festive tutu to sew onto a t-shirt and you’re on your way to learning how to make your own clothes for your kids. Stuffed Valentine Person – If you’re looking for simple holiday craft ideas, try this adorable stuffed Valentine person. Sew a stuffed heart buddy to use as a pillow or a Valentine’s Day decoration. He’s sure to make you feel loved! Valentine’s Day Cuteness – Wouldn’t it be fun to have a special outfit your daughter can wear on Valentines Day? The Valentines Day Cuteness project is the perfect thing! Make this holiday craft and she’ll be so excited. Love-ly Valentine’s Shirt and Headband – Get your child ready for Valentines Day by making these cute sewn projects. The Love-ly Valentines Shirt and Headband Tutorial will teach you how to create this outfit, perfect for Feb. 14th! For 54 Valentines Hearts Crafts, including cards, gifts, jewelry, kids crafts, and more, visit FaveCrafts.